All matter is made up of atoms. 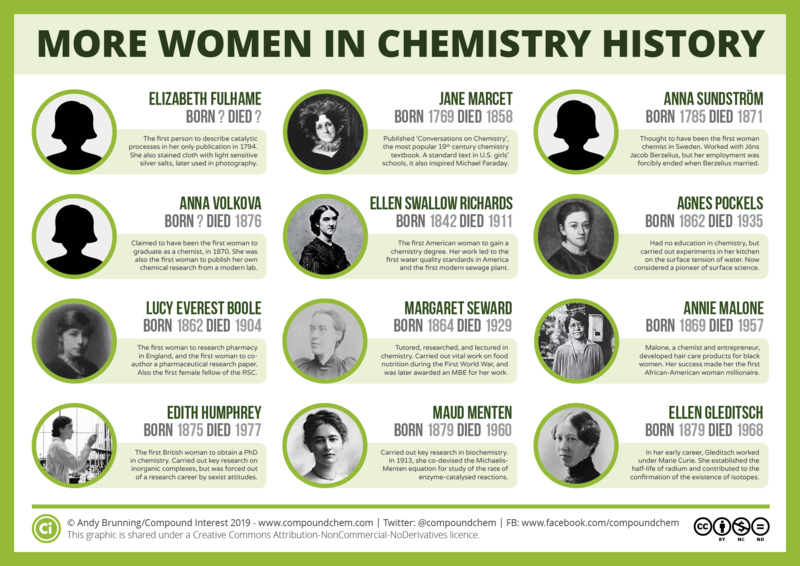 This is something we now take as a given, and one of the things you learn right back at the beginning of high school or secondary school chemistry classes. Despite this, our ideas about what an atom is are surprisingly recent: as little as one hundred years ago, scientists were still debating what exactly an atom looked like. 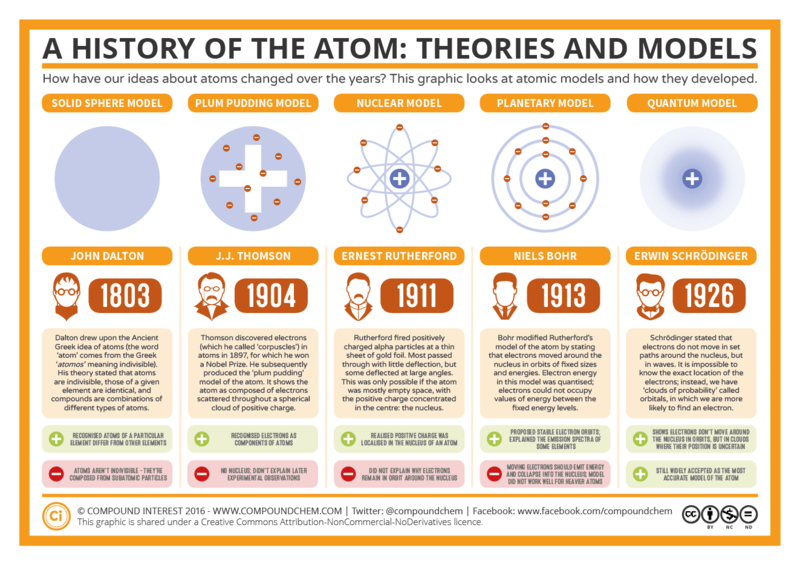 This graphic takes a look at the key models proposed for the atom, and how they changed over time. Though our graphic starts in the 1800s, the idea of atoms was around long before. In fact, we have to go all the way back to Ancient Greece to find its genesis. The word ‘atom’ actually comes from Ancient Greek and roughly translates as ‘indivisible’. The Ancient Greek theory has been credited to several different scholars, but is most often attributed to Democritus (460–370 BC) and his mentor Leucippus . Though their ideas about atoms were rudimentary compared to our concepts today, they outlined the idea that everything is made of atoms, invisible and indivisible spheres of matter of infinite type and number. These scholars imagined atoms as varying in shape depending on the type of atom. They envisaged iron atoms as having hooks which locked them together, explaining why iron was a solid at room temperature. Water atoms were smooth and slippery, explaining why water was a liquid at room temperature and could be poured. Though we now know that this is not the case, their ideas laid the foundations for future atomic models. It was a long wait, however, before these foundations were built upon. It wasn’t until 1803 that the English chemist John Dalton started to develop a more scientific definition of the atom. He drew on the ideas of the Ancient Greeks in describing atoms as small, hard spheres that are indivisible, and that atoms of a given element are identical to each other. The latter point is one that pretty much still holds true, with the notable exception being isotopes of different elements, which differ in their number of neutrons. However, since the neutron wouldn’t be discovered until 1932, we can probably forgive Dalton this oversight. 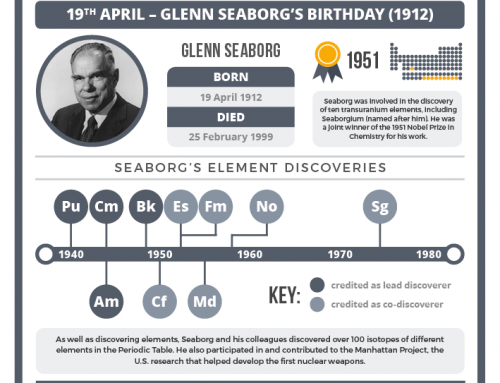 He also came up with theories about how atoms combine to make compounds, and also came up with the first set of chemical symbols for the known elements. Dalton’s outlining of atomic theory was a start, but it still didn’t really tell us much about the nature of atoms themselves. What followed was another, shorter lull where our knowledge of atoms didn’t progress all that much. There were some attempts to define what atoms might look like, such as Lord Kelvin’s suggestion that they might have a vortex-like structure, but it wasn’t until just after the turn of the 20th Century that progress on elucidating atomic structure really started to pick up. The first breakthrough came in the late 1800s when English physicist Joseph John (JJ) Thomson discovered that the atom wasn’t as indivisible as previously claimed. He carried out experiments using cathode rays produced in a discharge tube, and found that the rays were attracted by positively charged metal plates but repelled by negatively charged ones. From this he deduced the rays must be negatively charged. By measuring the charge on the particles in the rays, he was able to deduce that they were two thousand times lighter than hydrogen, and by changing the metal the cathode was made from he could tell that these particles were present in many types of atoms. He had discovered the electron (though he referred to it as a ‘corpuscle’), and shown that atoms were not indivisible, but had smaller constituent parts. This discovery would win him a Nobel Prize in 1906. In 1904, he put forward his model of the atom based on his findings. 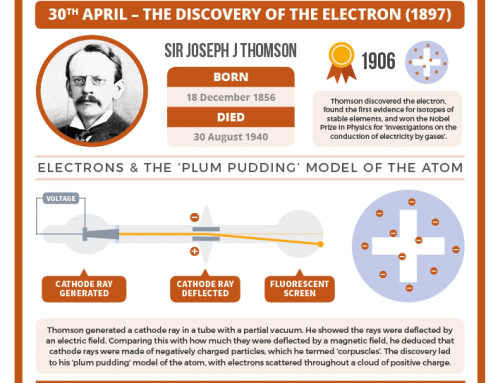 Dubbed ‘The Plum Pudding Model’ (though not by Thomson himself), it envisaged the atom as a sphere of positive charge, with electrons dotted throughout like plums in a pudding. Scientists had started to peer into the atom’s innards, but Thomson’s model would not hang around for long – and it was one of his students that provided the evidence to consign it to history. Ernest Rutherford was a physicist from New Zealand who studied at Cambridge University under Thomson. It was his later work at the University of Manchester which would provide further insights into the insides of an atom. This work came after he had already received a Nobel Prize in 1908 for his investigations into the chemistry of radioactive substances. Rutherford devised an experiment to probe atomic structure which involved firing positively charged alpha particles at a thin sheet of gold foil. The alpha particles were so small they could pass through the gold foil, and according to Thomson’s model which showed the positive charge diffused over the entire atom, the should do so with little or no deflection. By carrying out this experiment, he hoped to be able to confirm Thomson’s model, but he ended up doing exactly the opposite. During the experiment, most of the alpha particles did pass through the foil with little or no deflection. However, a very small number of the particles were deflected from their original paths at very large angles. This was completely unexpected; as Rutherford himself observed, “It was almost as incredible as if you fired a 15-inch shell at a piece of tissue paper and it came back and hit you”. The only possible explanation was that the positive charge was not spread throughout the atom, but concentrated in a small, dense centre: the nucleus. Most of the rest of the atom was simply empty space. Rutherford’s discovery of the nucleus meant the atomic model needed a rethink. He proposed a model where the electrons orbit the positively charged nucleus. While this was an improvement on Thomson’s model, it didn’t explain what kept the electrons orbiting instead of simply spiralling into the nucleus. Enter Niels Bohr. Bohr was a Danish physicist who set about trying to solve the problems with Rutherford’s model. He realised that classical physics could not properly explain what was going on at the atomic level; instead, he invoked quantum theory to try and explain the arrangement of electrons. 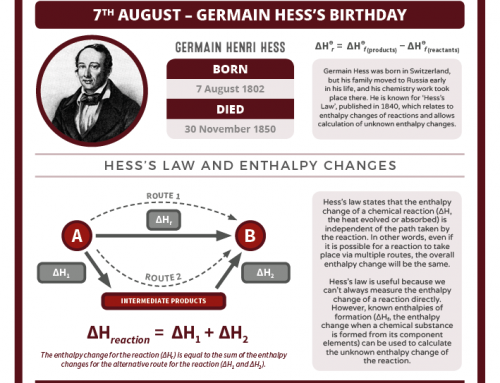 His model postulated the existence of energy levels or shells of electrons. Electrons could only be found in these specific energy levels; in other words, their energy was quantised, and couldn’t take just any value. Electrons could move between these energy levels (referred to by Bohr as ‘stationary states’), but had to do so by either absorbing or emitting energy. Bohr’s suggestion of stable energy levels addressed the problem of electrons spiralling into the nucleus to an extent, but not entirely. The exact reasons are little more complex than we’re going to discuss here, because we’re getting into the complex world of quantum mechanics; and as Bohr himself said, “If quantum mechanics hasn’t profoundly shocked you, you haven’t understood it yet”. In other words, it gets kind of weird. Bohr’s model didn’t solve all the atomic model problems. It worked well for hydrogen atoms, but couldn’t explain observations of heavier elements. It also violates the Heisenberg Uncertainty Principle, one of the cornerstones of quantum mechanics, which states we can’t know both the exact position and momentum of an electron. Still, this principle wasn’t postulated until several years after Bohr proposed his model. Despite all this, Bohr’s is probably still the model of the atom you’re most familiar with, since it’s often the one first introduced during high school or secondary school chemistry courses. It still has its uses too; it’s quite handy for explaining chemical bonding and the reactivity of some groups of elements at a simple level. At any rate, the model still required refining. At this point, many scientists were investigating and trying to develop the quantum model of the atom. Chief amongst these was Austrian physicist Erwin Schrödinger, who you’ve probably heard of before (he’s the guy with the cat and the box). In 1926 Schrödinger proposed that, rather than the electrons moving in fixed orbits or shells, the electrons behave as waves. This seems a little weird, but you probably already recall that light can behave as both a wave and a particle (what’s known as a wave-particle duality), and it turns out electrons can too. Schrödinger solved a series of mathematical equations to to come up with a model for the distributions of electrons in an atom. His model shows the nucleus surrounding by clouds of electron density. These clouds are clouds of probability; though we don’t know exactly where the electrons are, we know they’re likely to be found in given regions of space. These regions of space are referred to as electron orbitals. It’s perhaps understandable why high school chemistry lessons don’t lead in straight with this model, though it’s the accepted model today, because it takes a little more time to get your head around! Schrödinger’s wasn’t quite the last word on the atom. In 1932, the English physicist James Chadwick (a student of Ernest Rutherford) discovered the existence of the neutron, completing our picture of the subatomic particles that make up an atom. The story doesn’t end there either; physicists have since discovered that the protons and neutrons that make up the nucleus are themselves divisible into particles called quarks – but that’s beyond the scope of this post! At any rate, the atom gives us a great example of how scientific models can change over time, and shows how new evidence can lead to new models.